As graphical MMOs took off in the 1990s with the advent of games like Neverwinter Nights, The Realm, and Ultima Online, many of them did so with the help of gaming service providers. It might be hard to imagine today, but back before the web was ubiquitous, people who wanted to go online usually did so through a specific service provider that functioned as both a gatekeeper to the internet and a purveyor of specific games and programs — some of which were completely exclusive to those companies. Console players might understand these best by thinking of them as similar to how Xbox Live and the PSN operates. Thus, if you wanted to access, say, The Shadow of Yserbius in the early ’90s, your only recourse was to sign up for Sierra On-Line and pay a monthly membership fee (as well as a possible additional game fee) to that provider. Slow speeds, primitive (or no) graphics, and hourly costs were the norm and made it difficult for these services to gain mainstream traction. Over the span of a decade-and-a-half, these companies jostled for supremacy and customers, even as their whole existence was eventually rendered moot by the reshaping of the online culture and the loosening of internet restrictions concerning for-profit ventures. By the 2000s, PC service providers had largely disappeared, leaving most MMOs to be accessed by specific clients. Today we’re going to blitz through a list of some of the big names of these gaming service providers and the online titles that they used to draw in fans. Prodigy rolled out in 1984 as part of AT&T (remember that? ), and it’s one provider that I clearly remember first experiencing as a kid. Our computer class instructor hooked one of the machines up to a modem and then let us take turns poking around Prodigy, looking up the ski conditions in Aspen — because we were jet-setting junior highers, I guess — and trying to wrap our minds around the concept of email. Prodigy’s colorful graphical user interface allowed it to quickly grow to become the number two online service provider by 1990. It offered a central portal to many internet functions, such as bulletin boards, news, and online shopping. It also had games, although fewer of the proto-MMOs that its competition boasted. Probably its most famous title was MadMaze, an adventure romp through a fantasy labyrinth. Unlike many of its contemporaries, Prodigy initially charged a flat monthly (instead of hourly) rate for unlimited use. Prodigy struggled with figuring out how to run its service and make money with it, as it started to bleed millions as the ’90s progressed. While the company eventually created a different service to be a true ISP, Prodigy Classic, as it was called, was eventually discontinued in 1999. General Electric, of all companies, decided to get into the online business with the debut of General Electric Network for Information Exchange, or GEnie, in 1985. While GEnie was somewhat of an underdog compared to CompuServe, it enjoyed a reputation as a place where online games ruled. One such game was Air Warrior in 1988. The multiplayer dogfight simulator was a huge hit on the service even though it initally cost $10 an hour to play. Air Warrior would later be ported to other service providers in the 1990s, costing GEnie its exclusivity. The service provider also hosted MUDs like GemStone and the popular Multiplayer BattleTech. Sadly for its legacy, GEnie crawled to a stop in 1999. In 1991, Sierra Online took its gaming focus online with the ImagiNation Network (INN). The service offered a friendly and colorful interface that allowed users to access many games, including Red Baron (a dogfighting simulator), an online casino, and the multiplayer dungeon crawler Shadow of Yserbius. INN was purchased in 1994 by AT&T (which attempted to bolster the service) and subsequently in 1996 by AOL (which shut it down). The Source came into being in 1979 as a way to use dial-up modems to access a wide variety of information. It was initially purchased by Reader’s Digest (yes, that magazine your grandma gets) and eventually bought out by rival CompuServe in 1989. Pioneering the far-flung concept of online connectivity and features back when most families were still playing Pong, CompuServe got a headstart in the realm of service providers with its launch in 1979 under the name of MicroNET (a year later it would be rebranded as CompuServe Information Service). It’s notable that in 1980, CompuServe introduced an IM service called CB Simulator, one of the first of its kind. It was purchased and run by H&R Block (yes, the tax people) that year as well. CompuServe developed a loyal following and enjoyed considerable popularity, becoming “the Google of the ’80s” and growing to around three million users by 1995, although it suffered by primarily being text-based while its competition used graphics. Gradually the company and expanded its service to include online games such as Richard Bartle’s MUD (under a different name) and Island of Kesmai, which cost users $12 an hour to access. The WWW put a heavy hit out on CompuServe, which eventually got folded into AOL’s corporate umbrella in 1997. Classic CompuServe, as it was called, lasted nearly 30 years until its shutdown in 2009. Delphi’s beginnings go back to 1981, where it became the first online encyclopedia (hey, we’re all nerdy in our own way). It primarily became a hangout for users to chat over message boards, although the service started providing internet access as early as 1992. Delphi never did get very big, peaking at only 125,000 users, and started getting passed around to different companies by the mid-’90s. Quantum Computer Services was the second name for the company that would eventually be called AOL (but more on that in a bit!). QCS decided that it would focus on providing online services for the popular Commodore 64 and 128 computers, calling it Quantum Link. The service would run from 1985 to 1995 and is notable as the platform on which LucasFilm’s Habitat, the first graphical virtual world, was tested for a couple of years. If you were a computer user in the ’90s, then you were quite familiar with AOL CDs. Reportedly, the company spent over $300 million to manufacture and distribute its seemingly neverending home invasion of compact discs in the attempt to draw in new users. And it worked, too, as at one point AOL was gaining a new subscriber every six seconds and amassed 30 million users. AOL had a lot to offer its users as well, including its popular email, web access, and instant messaging client. In 1991, the company offered access to Neverwinter Nights, which is widely seen as one of the first true graphical MMORPGs. AOL tried to adapt to the massive changes to the online business space as the decade went on and continued to survive (even if it did fall from its position as king of the virtual world). The company merged with Time Warner in 2000 for a whopping $350 billion but was eventually spun off from that company as its popularity declined. In 2015, AOL was purchased by Verizon. As the web took off, service providers morphed in look and function. One of the newer forms came into being as MSN Gaming Zone, a gaming web portal that was run by Microsoft. While the portal initially offered low-key games like backgammon and spades, it would become known for being the launch platform for Asheron’s Call in 1999 prior to Turbine completely taking over the title’s operations. Apple took a stab at being a service provider with 1994’s eWorld, an “internet on-ramp” that was feature-rich but came at a bad time to attract too many subscribers and was exclusive to Macintosh computers. Let us remember that the ’90s were not Apple computing’s hayday, either. The service quietly closed down two years later in 1996. Does anyone else remember MPlayer for games? Was like steam. I remember played a bunch of rainbow six games on that as well as Command & Conquer and what not. Am I the only one left?!? I’m born in ’87 so even the 90s are just a vague memory. So no good ol days only if diapers and pacifier are part of these days. 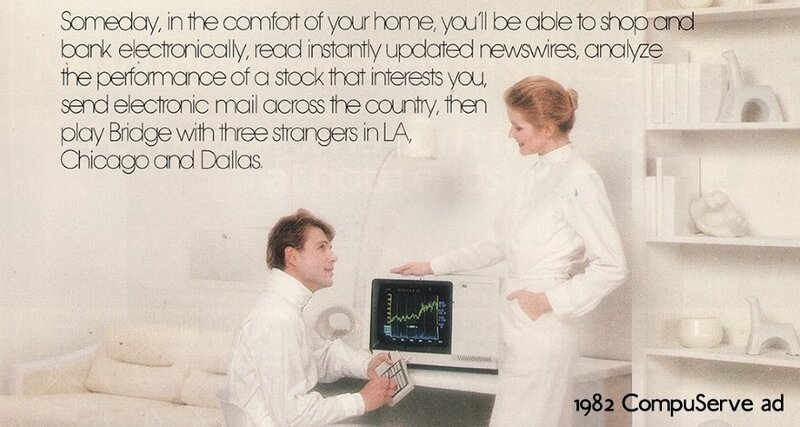 and that CompuServe ad makes me giggle. FUTURE! SallyBowls1 Armsbend Robert80 Yep, they are largely involved in the money into pockets both directions scam. Pay the politicals, get the kickbacks. Wilhelm Arcturus Ppiper Man, I miss the old Fidonet/BBS days. Lots of great memories there.,. Ppiper But was your BBS on FidoNet? I was at 1:143/38 if I remember right. Oh, you’re wrong on eWorld. 1994, when it started, was very much a peak period for Apple. And eWorld would have been about 1000% better for us 3rd party Apple devs than the horror of AppleLink, the online service they had in place to support us and dealers and the like. There was a market for it. But in a massive show of ego… execs on the eWorld team were talking about how they were going to put AOL out of business… and stupidity, Apple screwed up a lot of eWorld. But it could have still been a contender had they not made one critical, yet easily avoided error. Some day I am going to write a blog post about that. Very much a “for want of a nail” story that cascaded into failure. In the end though, the WWW was already a thing and by 2000 companies were doing their support and downloads on that and things like eWorld were obsolete. It was doomed anyway, but it need not have been the complete fiasco it was. When I was a kid, I got into colleges in my hometown representing myself as a student, sneaking into computer labs with FDD that had “show password” utility. And stole internet passwords so I could use them at home at night. It was modems and dial ups era. Didnt use it for online games though, I didnt even know about their existance. Mostly surfed internet saving every page on HDD so I could read it later because speed was sooo low and I wanted to save as much pages I could.